John Mitchell made his Waikato debut in 1985, playing at No.8, blindside and lock, before nailing down his place as the club's first-choice at the base of the scrum. Mitchell was handed the Waikato captaincy in 1989, but a broken leg meant that his first season as skipper was spent mostly on the sidelines. He was reinstated in 1991 and led the side until his retirement from playing ahead of the 1995 season. After a stint coaching with England, Mitchell took charge at the Chiefs for the 2001 Super 12 season. After a successful integration into New Zealand coaching, Mitchell was appointed as All Blacks coach in October 2001. Mitchell coached the side through to the 2003 World Cup, but his side's failure against Australia in the semi-finals cost Mitchell his job. He took up a job with his former side Waikato in the 2005 NPC before taking charge of the newly-formed Super 14 side Western Force, based in Perth, in 2006. 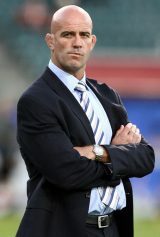 In December 2008, Mitchell was placed under restricted control at the Force, with rumours of a player revolt circulating due to their unhappiness with Mitchell's methods. He returned to action soon after but in 2010 left the franchise early in order to take up the head coach role with the Lions in Johannesburg. While in South Africa coaching their Currie Cup side Mitchell was stabbed twice at his home during an attempted robbery. He was hospitalised but quickly returned to his duties with the team. Midway through the 2012 season he was suspended by the Lions amid reports of dressing room unrest.